The hour just after sunrise and the one again before sunset are the Golden Hours according to photography wisdom. They are golden because the light is apparently softer and the shadows are fewer… or something. These technical aspects of photography are not really my thing, I must confess. I do know that the weather can influence the colours of sunrise and sunset. I also know that while the visual effects are beautiful, the physical effects of the weather can be catastrophic for those affected by it, and often those most affected are the poor. 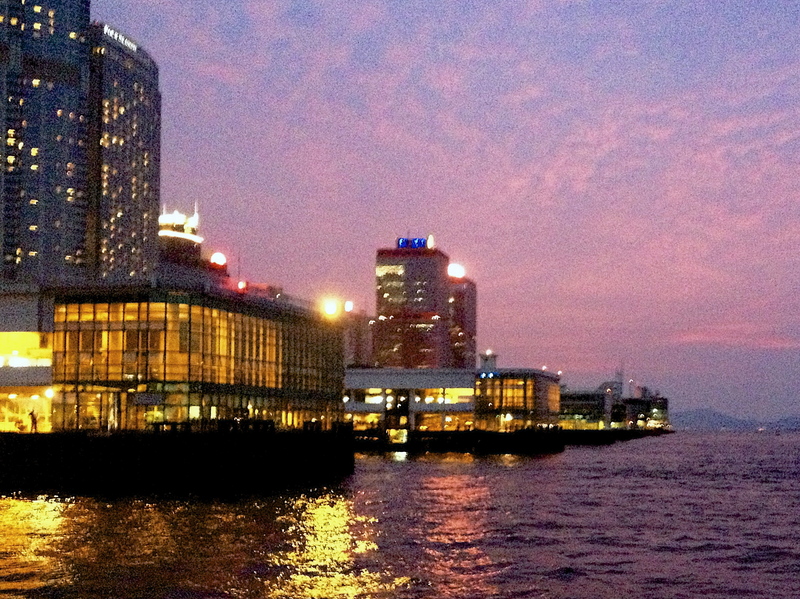 This particular photograph, of the ferry pier on Hong Kong Island with the red sky of sunset behind, was taken on a day when the weather was not just influencing the light and the circumstances of people in Hong Kong, but elsewhere in Asia as well. While Hong Kong was sweltering in extremely hot temperatures (and beautiful skies), tourists in Taiwan were being evacuated in anticipation for a super-typhoon (Soulik). Ultimately Soulik killed two people and injured scores of others in Taiwan before going on to cause havoc in China (here is more on this). Summer is indeed typhoon season in this part of Asia. After living here a while (as someone reasonably well off), I, like many, have become quite blasé about the storm warnings when they are issued. While a T1 warning is often viewed as an indicator that the weather will be lovely, if rather hot, one has some awareness that one should really not ignore the higher warnings–specifically the T8 and T10 as this is when the real weather starts. According to the Hong Kong Observatory, which has a wonderful weather app that I highly recommend, a T8 Storm has Gale force winds with gusts up to 180Km/hr, while a T10 has hurricane force winds (sustained winds at 118km/hr with gusts at 220km/hr). People die because of the damage caused by the wind (see this story about Typhoon Rose in 1971). Though in recent years the death tolls as a result of the winds associated with tropical storms have declined, largely as as a result of the warning system. In addition to wind, there is rain… lots and lots of rain. Although not a determinant of the warning level, the rain is certainly a significant hazard associated with typhoons in Hong Kong (there are also rain storms that are not associated with wind and are classed according to severity–yellow, red, and the most sever, black). Severe flooding and landslides in the less built up areas are often the result. Although China (and many other places) has high death tolls on a yearly basis as a result of flooding and landslides, Hong Kong has also managed to limit the casualties associated with this aspect of the tropical storm weather events. The hidden casualties of these storms are those caused as a result of the associated heat. Frequently, before the storm arrives, very hot temperatures (above 32 degrees C) are experienced within the region. In the high population density areas the heat island effect can cause temperatures to be 4 degrees C higher than in non-built up areas. According to one report for every 1 degree that the temperature rises over 29 degrees C, the death rate increases somewhere between 4 and 6 percent (and other studies suggest 7% increases, see this report by Wong et al 2012). The people who are most affected by this are the poor, who do no have as much access to air conditioning as those who are more well off. Indeed, those living in the highest density housing (such as in the subdivided flats and cage housing) will not have domestic AC. Moreover, because of the cramped and poorly ventilated conditions in this housing, the internal temperatures can be unbearable and far in excess of the already hot outside temperatures. My own experience visiting this sort of housing and conversations with residents confirms that temperatures can reach well beyond 40 degrees C. What is more, as those who can afford air conditioning cool their living spaces, they further contribute to the Urban Heat Island effect (see this report on the contribution of AC to UHI). As we were riding the ferry into Victoria Harbour, the red of the sky set against the yellow of the windows was striking. So striking that I felt compelled to take a photograph and thereby take advantage of the light of the Golden Hour. A bit of geography, however, reveals hidden dimensions behind what was a beautiful image. One might initially try to resist the understanding revealed, as it has the potential to diminish the beauty in the seeing. This is, of course understandable; there often isn’t enough beauty in the world, so why should one seek to diminish that which is? One might also feel helpless in the face of this backstory knowledge because nature is difficult to control, as severe storms frequently demonstrate and as King Canute learned to his peril. There are, however things that we can do to reduce the burden of severe weather on those most affected by it. Firstly, we can increase the temperature thresholds before air conditioning is used. According to OSHA the optimum temperature for workplaces is somewhere between 20 and 26 degrees C. If the AC were set closer to 26 degrees, and workplace clothing norms reflected this higher temperature expectation, there would be savings in greenhouse gas emissions (linked to global warming) and a reduction in the UHI effect. If retail outlets were required to keep their doors closed when the AC is turned on (and turned down), this also would reduce the burden. And, of course, affordable and suitable housing, that is properly ventilated and designed to maximize energy efficiency in terms of cooling as well as heating was made available, perhaps then we could all enjoy the sunset as we wait for the storm to roll in. This post was in response the the WordPress Weekly Photo Challenge: The Golden Hour. You can find the challenge here. This entry was posted in Geographies, Social Positions and tagged Asia, dailypost, golden hour, Hong Kong, Photography, poverty, social justice, Urban Heat Island, Victoria Harbour, Weekly Photo Challenge: The Golden Hour by geofoodie. Bookmark the permalink. Oh oh oh It’s posted 🙂 You didn’t unspam me did you? No I did not– I fugured you were enjoying the Laboutins– I think WP have sorted the problem! I think so too. Back to my Clarke’s T bar sandals. Just another test I’m afraid. Check out my spam post again and look at what a helpful WP person wrote back to us. It should make you smile. Living in permanent AC is so bad for one’s health but so necessary for peace of mind and a topic close to my heart recently too. Love the accompanying pic.